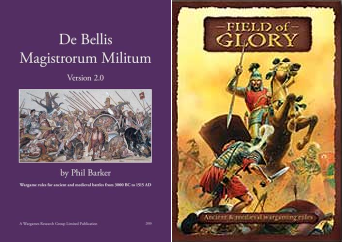 2010 has seen me abandon DBMM for Field of Glory in a search of more fun in my wargaming. Overall I'm pleased with both the game itself and my progress as a player. I'm still not as quick as I'd like to be but I'm certain that's only a matter of time. I would also like to take this opportunity to thank everyone at MAWS for their help and encouragement during this transition. My DBMM armies have transferred easily to Field of Glory and I've enjoyed using my Mongol and Later Polish armies. I've had to adapt my style of play a touch but not too much. More importantly, I've yet to experience any of the "espirt d'escalier moments" that undermined my enjoyment of DBMM. Anyway, last weekend I managed to play FOG in the Northern League doubles competition at Halifax without making a complete fool of myself. Graham and I ended the day with a big loss and a big win. The Halifax competition was the final part of my wargaming plan for 2010. So this feels like a good time to review my experience with Field of Glory from mystified novice to first time competition player. The terrain placement system is brilliant; simple and easy to use. The rules are clear and straightforward; if not well indexed. The basic rules and concepts are easy to understand and memorise. It's not as difficult to play as the rulebook makes it appear. There is a solid logical structure in FOG without too many exceptions. Each of the five phases is relatively simple and self consistent. There isn't a lot of "chrome" to learn like weather, time of day etc. The battle group concept works well as does the idea of Commanders. Game is fluid and feels dynamic; very different from DBMM. Cavalry can attack, evade and manoeuvre well, and it just feels right. At first sight the five phase structure appears onerous and overly complex and it's important to do things in the right order. As I started to get the hang of things, I then found I was missing things through lapses in concentration. Complex melees can be particularly intimidating. Even a 2 against 1 seemed hard at first. The thing to do is split the dice based on opponents and factors; roll all the dice; and then tally hits given and taken by each battle group involved. Applying points of advantage (POA) was initially a little tricky because the effects aren't the same for shooting (2 to 6) and melee (3 to 5) and POAs don't cancel one another out in shooting but do in melee. As noted elsewhere the way dice are used in Field of Glory is very different from DBMM. When rolling to hit on a score of 4 or more, a 4 is as good as 6. This was a big psychological shift that you have to get used to. The cohesion test is king! I know it says this in the rules but disrupting your enemy is more important that removing a base. This is because the system is designed to cause cohesion to drop away sharply; it is a very slippery slope you do best to avoid. What don't I like about FOG? The rulebook is a boring read. In play the pictures, but not the examples, get in the way. There's more than a touch of the "Wargamer's Pretentious" style of prose in evidence. After playing DBx for more years than I care to remember I find the troop definitions overly complex. For example cavalry, average, drilled, bow swordsmen still seems long winded if not outright cumbersome. There's a layering of simple mechanisms in FOG that is daunting at first which then becomes a touch tedious. For example: in combat you have to work out how many dice and at what factors; roll them; work out the winners and losers; work out the factors for any cohesion tests; roll more dice; roll a final dice for risks to Commanders in combat. It gets worse if you have poor, superior or elite troops as there are quality rerolls to deal with. This "dice layering" is a major barrier to playing quickly; not insurmountable but a barrier nonetheless. Using the official play sheet. Unsurprisingly, it's designed as an aide memoire for experienced players but as a learner I've seen it cause more problems than it solves. The factors from all phases are lumped together and it's all too easy to apply factors in the wrong phase. In the early games it was hard to follow up initial breakthroughs and finish off an opponent quickly despite the fluid movement possible. It has got easier but I'm still not convinced FOG is inherently decisive. What would you recommend a newcomer do? Get someone who's played FOG before to introduce you to the game. This will show you that the game is fun right from the start. Don't play large games. 800 points may be OK for doubles or experience players but 650 is far better. Smaller games are quicker and less likely to induce headaches. Be patient with the rules. Playing without help will be slow at first and the rules will feel a touch cumbersome. Play to learn don't play to win. Learn your army by playing a few games with an almost static list. Give yourself a chance to learn the strengths and weaknesses of your battle groups before trying something different. Play other people as soon as you can. This stops you developing bad habits and also shows you how others play the game. I can only echo the common advice to keep the full turn sequence to hand at all times. The rulebook stands up well in games but the index is very poor. Print a copy of the FOG Players' Index; it helped me to find things really quickly. Don't use the play sheet at first. Use the tables in the rule book or produce your own "Learners QRS" by splitting the play sheet into the separate phases. The latter uses more paper but it simplifies each phase by reducing the list of factors involved at any one time. I hope this has been of use especially if you are considering playing Field of Glory for the first time. Let me know by leaving a comment or two. As to the future, I have quite a few games still to play in the remainder of 2010 including the final round of the Northern League in November. Then I have to decide what to do in 2010. Will it be Field of Glory Renaissance or will Graham and I enter the Northern League seriously and play as many rounds as possible? Thanks for posting, Ive enjoyed your comments on the FOG journey,its a rule set Ive looked at but never dipped my toe in(so to speak. I think it will remain Impetus and Warmaster for me. This post is now the most popular article. Not bad in four days. You can now read the whole "Befuddled to Mystified" story in one article. First published in Slingshot, 273, Nov 2010.